In the summer of 2017 Patricia McCarthy stepped down as editor of The Letter, a role she had filled since 2013. As the summer 2017 issue was a special issue in tribute to Bill Richardson it’s only now that I have the opportunity to thank Patricia for the enormous time and effort she has devoted to The Letter, over the last four years in particular. 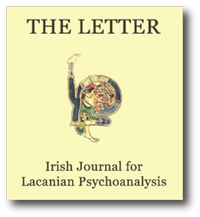 Issues 52 to 64 bear the stamp of Patricia’s tenure as editor in the serialisation of Cormac Gallagher’s translation of Christian Fierens’ The Psychoanalytic Discourse: A Second Reading of Lacan’s L’étourdit, a valuable resource for anybody attempting to get to grips with this challenging but essential work. Also, her commitment to the work of the members of the Irish School for Lacanian Psychoanalysis (ISLP) has served to support and encourage the work of the School and is something I intend to continue. I am glad to say that Patricia has not fully ‘retired’ from The Letter and will be continuing to lend her support as a corresponding editor. Helen has asked me to open this conference and welcome you all. The title as you know is: Why was psychoanalysis founded by an emigrant? and what’s interesting about the place we find ourselves in today, The Marino Institute, is that it was one of the training grounds for the Christian Brothers. The Christian Brothers were great founders (since we’re talking about founding psychoanalysis here today), founders of primary schools, secondary schools, Colleges and Universities even. Right across the English speaking world you had the mark of the Christian Brothers who were founding things and one question I have is; what is the difference between founding a University or a College and founding psychoanalysis? What does it mean to found psychoanalysis? In our own history, you could say Jonty Hanaghan started off back in the Forties but I suppose psychoanalysis really got going in the University with several different schools of training, starting about the 1980’s. The school of psychotherapy was the first and then afterwards we had APPI, and then, after that, various other groups emerged. In New Studies on Hysteria, Charles Melman identifies four concepts: traumatism, incompatibility, repression and unconscious. Beyond the image is to be found a repressed and rejected cast-off; the constitution of whom, Melman asserts, is freshly preserved. Unremittingly, this original signifier’s infiltration presents the hysteric’s psychosomatic manifestations. Sounding out that foreign body, Freud’s discovery assures us that psychoanalysis alone, in deciphering the language of symptomatology, gives recognition to and discharges that real place of suffering. Keywords: Freud; Melman; repression; hysteria; incompatible; rejection; signifier. It is intolerable. It is rejected. Its rejection becomes an intolerable and highly charged infiltrating agent. In New Studies on Hysteria Dr Charles Melman restores Freud’s inauguration of the essential concept of repression and of the unconscious, because one is correlative with the other. The development of these new writings presents us with an idea of the freshness with which hysteria signifies the embodying preservation of an ancient, pervasive, unconscious text. What is it that we don’t want to know about the history of our subject; what implicates a traumatism so incompatible? The psychoanalyst has something new to tell us; firstly, fundamentally, he refers us to Freud. Hysterical discourse is an attempt at creating a rapport with the Real of the body. The body’s expression of symptoms comes from the Real, a body disposed to jouissance. For the hysteric, it is a jouissance deprived of the phallic signifier. The pseudo original signifier replacing S is foundational and gives rise to a new moral order. The pseudo signifier and S will organise a gap, which will maintain a dissatisfaction. At the core of the hysteric’s discourse, the subject supports himself only by dissatisfaction as a result of the failure to seize the lost object through the signifier. Objet a as cause of desire is subsumed under an object as lost as if it were another human being. This is defended against through insistent demand. This paper aims to consider the four fundamental concepts of psychoanalysis, as outlined by Jacques Lacan in Seminar XI. Special attention will be paid to his theory of Alienation and Separation. Keywords: Freud;Lacan; unconscious; repetition; transference; the drive; excommunication; aliens; legislation; alienation; separation; desire. This paper aims to look at how, through working with hysterical patients, Freud developed the revolutionary technique of psychoanalysis which allowed the patient to both make sense of her symptom and enabled her to find a way of resolving it through speech. The way is paved for a relief through speaking because, as Freud demonstrates, each symptom is constituted symbolically. His humility of approach and willingness to learn from his patients is striking. Lacan follows in Freud’s footsteps and impresses on us the importance of listening to what in the patient is struggling to be heard. In this way, in attempting to deal with the past, we are given the opportunity to approach the future differently, having transformed the Imaginary via the Real through working in the Symbolic. This paper looks at the link that might exist between psychoanalysis and emigration within language, by examining the perspective that Freud, who emigrated to London towards the end of his life, gives us in “Moses and Monotheism”. Keywords: Exile; language; psychoanalysis; loss; Moses. I shall try to explore this further with you. This verse comes from a beautiful hymn to the Virgin Mary which is sung at Compline, at evening prayer. It evokes our position as humans; as separated beings exiled from the object of our desire which is within God; as children of Eve, exsules filii Hevae, that is to say, permanently excluded from earthly paradise, from Eden, awaiting celestial paradise and eternal felicity. So, we can follow this with Saint Paul, ‘For now we see in a mirror dimly, but then face to face. Now I know in part; then I shall know fully, even as I have been fully known’. In another letter he evokes that future in which we will have full knowledge. This paper looks at the distinction between three related but distinct terms, reconstructing, remembering and reminiscences, in order to examine the origins of the key psychoanalytic concepts of repression and the unconscious. Imbedded in this exploration is a discussion on psychoanalytic practice, its task and its aim. Freud’s texts from 1893 to 1937 are consulted as are some of Lacan’s Seminars and texts from the 1950s which support Freud’s theses. There are musings on Freud’s being made to feel like an alien in his early student years and how he later described the unconscious as an alien, foreign body. The starting point of this paper is Freud’s assertion that ‘[h]ysterics suffer mainly from reminiscences’ and furthermore that the task of the analyst is to reconstruct these reminiscences so that the patient can be induced to remember. It is worth clarifying at the start, therefore, that reminiscences are not synonymous with remembrances and, furthermore, that remembering is not the same as reconstructing. Patricia McCarthy: I have two comments. My first comment is addressed to Malachi – Malachi, given that we suffer from a passion for ignorance, all of us, leaving us all, at the end of analysis, having to tolerate a certain ‘I don’t want to know anything about it’, my comment touches a bit on Cormac’s opening question on the difference between founding institutions of learning as opposed to the founding of psychoanalysis. Given that we suffer from this passion for ignorance, isn’t it necessary then for us to speak about the discourses, and the psychoanalytic discourse in particular, in order to better get our bearings? Dermot Hickey: Is your question specifically to Malachi’s paper? Patricia McCarthy: Not necessarily, because the two papers we’ve heard to date, both on hysteria, might seem a little distant from the title of the conference, namely, how to speak about the founding of psychoanalysis and why it was founded by an emigrant. Malachi McCoy: Patricia, I have something written here that we discussed in the work of the seminar group on New Studies on Hysteria. Just to read you a short paragraph from it. The unchanged persistence of the hysterical discourse constitutes the greatest opposition to what it would be to enter into a psychoanalytic discourse. So in that sense then isn’t the founding of psychoanalysis to do with the individual person … through the subject and beginning to speak, doesn’t the hysteric choose not to speak? Patricia McCarthy: But is it possible to speak about a founding of psychoanalysis? I suppose that’s my bigger question. Malachi McCoy: That’s the pivot of today’s conference. Charles Melman – Why Was Psychoanalysis Founded by an Emigrant? Why Was Psychoanalysis Founded by an Emigrant? This paper addresses the question ‘Why was psychoanalysis founded by an emigrant?’ It draws parallels between Freud’s position in relation to his father and that of both emigrant and hysteric. It is proposed that the position of the emigrant is fundamentally a guilty one in relation to the father and therefore the problem posed by emigrants is not simply at the origin of psychoanalysis but is still current to psychoanalysis. First of all I will say that we are – all of us – masochists. It’s the very condition of our survival. We are all masochists, which means that we live out our suffering and our problems face to face with God, as a confrontation with the very presence of the real of God, in other words, He who stops us from going too quickly to get to the end of our lives. First of all, he says that our time is His, in other words, what He has prescribed for us. A maniac is someone who wants to go too quickly to the end of his life. If we are masochistic and if that is the condition for our survival, we can’t tolerate the idea that God himself is a masochist because that would mean cutting him off from His power, as if He himself were subjected to another influence. From his earliest writings Freud frequently drew parallels between origin stories and psychoanalysis. In his later writings he goes further and makes direct links between the prehistoric and the unconscious: ‘the man of prehistoric times survives unchanged in our unconscious’ In relation to a similar theme of myth, Lacan states that to establish these connections seems ‘to me indispensable if we are to situate our domain well, or even simply find out where we are.’ This paper attempts to look at these parallels and connections with a view to assessing their relevance and application to psychoanalytic theory and practise. Key words: Mythic Formations; ancestral prehistory; totem; archaic heritage; residual phenomena. The founding of psychoanalysis is a milestone historical event. Freud’s ideas challenged our preconceptions of who we think we are. He embarked on a journey away from the familiar. Is there something pertinent in Freud leaving the familiar? Does ‘moving away’ from what is ‘familiar’ create a new space where we can dare to unshackle ourselves from stultifying influence of the mob? I will not attempt to draw conclusions from a biographical study of Freud’s early life but rather ask the question of whether something monumentally significant to an understanding of who we are, that is, the founding of psychoanalysis, could only be achieved through the speaking of a loss and thereby, truly moving away from the familiar. Keywords: Psychoanalysis; Freud; hysteria; emigration; loss; speak-being. This paper is a response to the question: Why was psychoanalysis founded by an emigrant? The paper proposes that speech being strange to the speaker is fundamental to psychoanalytic practice. This has consequences for the transmission of psychoanalysis. Keywords: subjectivity; speech; strange; lalangue; Gaeilge. Psychoanalysis occupies itself with what is experienced as strange in the most intimate aspect of ourselves, our speaking. 1 Whether a dream, a slip, a symptom or a joke there is a quality of it being a foreign production, albeit one of my own subjectivity, a product alien to my conscious sense of myself. It is in this direction that I am drawn in response to the question: Why was psychoanalysis founded by an emigrant? This fundamental experience of what is strange presents some problems: how do each of us in the field sustain the ability to tolerate the strange? How do we work together without making the language of the group over-familiar and the basis of group membership? How do we ensure that the discourse of psychoanalysis remains alive to the strangeness? Why would anyone engage in the work of psychoanalysis in this age, which is arguably more and more intolerant of subjective effects, of anxiety, of questioning? In 1971 Lacan introduced, through a slip, a term he then adopted – lalangue. Without fully grasping what he found to be usefully indicated by this product of a stumble [Versprechen], I propose that its appreciation may assist us in staying with the strangeness inherent in subjectivity. Attending to this term may prevent us straying too far into more calming waters. Guy le Gaufey: Charles you mentioned the omnipotence of God, or of the Father, and there is a history of omnipotence. God hasn’t always been omnipotent. He only became so after Job. Job is the inventor of omnipotence when he recognises that he will never understand the reasons why God works this way and not another way. That is the invention of omnipotence; the ignorance of the reasons of God, instead of the principle of reason I commented on this morning. I would like to comment on the invention of atheism. Lacan in the seminar on anxiety wants to give a new definition of atheism because he wants to think about the obsessional and he says that omnipotence is not the invention of the obsessional. In the Freudian world when we say omnipotence then, immediately, the Ratman comes to mind because Freud invented the expression the ‘omnipotence of ideas’. Lacan says, but of course, omnipotence does exist, it is the symbolic order – the name of omnipotence is in the symbolic order. The question is, is there any presence in this world? And the answer is, obviously, we have to think of omnipotence as the symbolic dimension without any kind of presence. My question is what about this definition of atheism? What do we think about it because there is a real conflict between this way of thinking about psychoanalysis and religion?